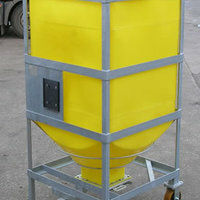 Reusable IBCs for dry goods. 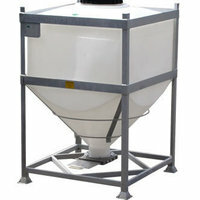 The DGC is a reusable silo IBC designed for the transportation and storage of dry goods e.g. powders and granules. The DGC liner is rotationally moulded in natural UV stabilised linear medium density polyethylene. The polymer has strong resistance to industrial wear and tear. 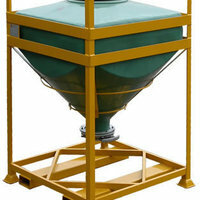 The conical base has a 90°cone angle which is designed to provide total discharge of the contents. 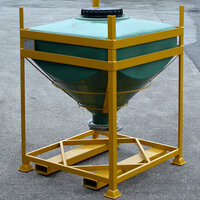 The liner is supported and protected by a galvanised mild steel frame, providing excellent resistance to the elements. The base of the frame has integral four way fork truck entry. The liner inlet, which is 350mm in diameter, has a PP³ screw cap fitted with an EPDM² O-ring seal as standard. The vertical outlet at the base of the liner can be specified with a slide valve or iris valve to suit individual applications. 460 mm clamp band lid, 360 mm arag hinged lid. Iris or Slide valve outlet. Coloured liner, anti-static liner, semi-conductive liner, flame retardant liner. Please complete the form below if you would like to enquire about the DGC 90.